It’s not June, it’s not even summer, and yet we’re here doing the same old same old – another cosplay armor. But this time it’s under some unique circumstances – for the first time ever, we’re not building this for a convention, or even for ourselves. Through some unexpected stroke of luck and some deep Reddit browsing, this is actually our first armor we’ve been paid to build as a commission. It’s the tail end of September when my partner with whom I always build cosplay with comes to me and tells me someone on Reddit wants to rent a mecha cosplay. We send him some pictures of our latest works – Quanta and Barbatos – and he sounds absolutely serious about it. While we would’ve been happy to ship out Barbatos or Quanta if our costs were covered, each suit presents their own logistical issue – Barbatos has a mace nearly taller than me, and Quanta’s body shield was both gigantic and plagued with reliability issues during our run with it. So our new friend took a look through our archives and found the good ‘ol days – when we first popped our mecha armor building cherry. He said he was down to make do with this one, cardboard and duct tape as it was. Unfortunately, while we did miraculously manage to retrieve the entire original armor (it’s been in some dusty netherworld for storage for maybe four years now), it obviously wasn’t in the best shape. None of our armors are ever in pristine condition after they’ve been ‘conned – they’re built specifically with a reliability rating of three days, after all. The Mk. I was particularly bad since it’s the oldest and most rudimentary, since we built it before we really knew anything about proper armor-smithing. So given this, we offered to still ship this suit out to our new client if he wanted it, but made sure to make the shoddy condition absolutely clear – if he wanted a nice suit that didn’t only look good at a mile away, this wasn’t going to deliver. There would also almost definitely be fitment issues – we’ve always built our tolerances tight, and I wouldn’t be able to fit in these suits (I’ve tried) because they’re tailored specifically to my partner’s measurements and body. 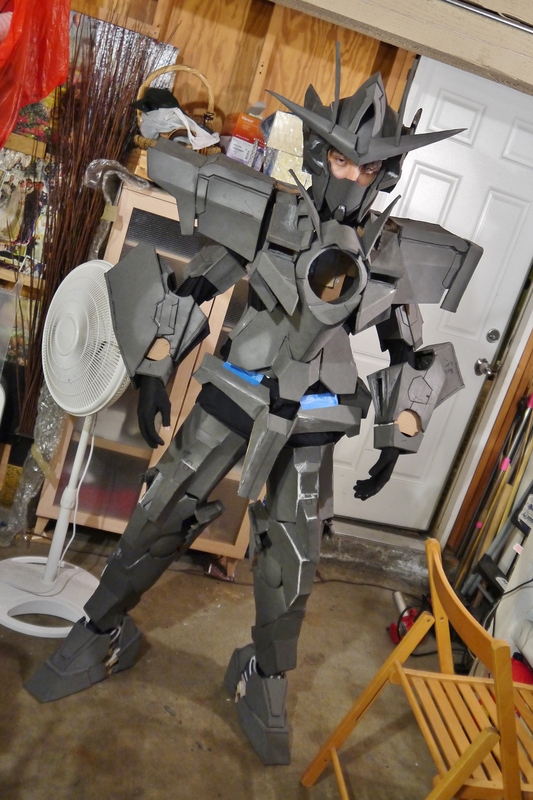 So, option 2: we build our client who wants a mecha armor his own mecha armor. It would of course be tailored to whoever he wants to wear it, and it would give us a chance to have some fun with an original design that isn’t a Gundam. It also wouldn’t be shoddy 5-year old cardboard and duct tape, so that’s a big bonus. I can only go into this project’s background so much though, since we don’t have all the details. Our client has big ambitions – this armor will apparently be a major set-piece for a trailer he’s planning to shoot and pitch for a 90’s-style Super Sentai series. 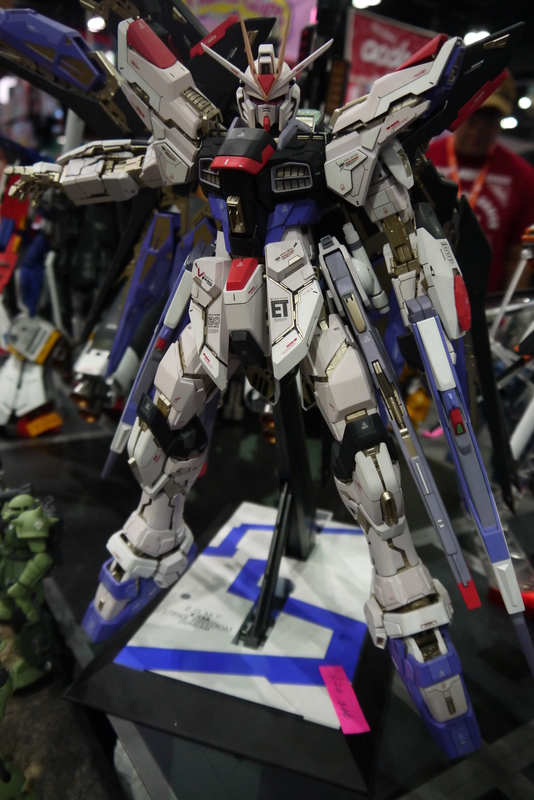 It’s meant to be original, I believe, so it would be best if it weren’t overtly an existing mech design taken straight out of Gundam or Super Robot Wars. The design process is of course a back-and-forth of design and approval, with a constant anchor being the MegaZord of Power Rangers fame. In the end we decided to go with a RX-78-2 and MegaZord fusion of design language – blocky and retro, with hints of Super Robot goodness. Our client has informed us that the mech’s name is to be Titan, hence the project name. Render whipped together in SketchUp and with customer approval, we’re ready to roll. We had mostly free reign here just to design something original, with the only real mandate being a circular design on the chest to accommodate the suit’s logo of colored rings. This isn’t the first time we’ve had people ask us to commission build an armor – and each time we’re asked, we’re very wishy-washy with our answer, because we know it isn’t particularly realistic to pull an endeavor like this off. Aside from requiring at least a month or two’s of work time depending on the complexity of the design, it also ends up being very expensive when you break it down. My partner and I usually grind on our cosplays – we don’t get started on it until a month before the big conventions, and when we do, we work all day nearly every day for a month straight leading up to the big show. On average I’d want to say each day is 14 hours of work, and if we say we work 5 out of 7 days a week for 3 weeks, that’s 210 total hours (this is all ballparking – I suspect we actually worked way more hours than this on Quanta and Barbatos). But if we charge our labor at the federal minimum wage rate ($7.25), then the average cost of one armor just in labor at those rates comes out to $1,522.50. At least one point of pride we take with our builds is our relatively conservative budget when it comes to materials and supplies though – all told I think our recent armors have barely capped the $250 mark. So this is why we’ve stayed away from commissions for so long, even though we’ve had the opportunities to take them – I can imagine most cosplayers would almost be insulted if we quoted thousands at them for an armor set, and we’ve never really come up with an “acceptable” price until now. For this job we decided to price it realistically – take the finished product as a whole and not the sum of its parts and how much do we think it’s worth? The answer was not $1700+ (because even we’d laugh ourselves out of the building at a price like that). But it’s not just work if we’re having fun while we’re at it. Both of us agreed that we’d rather build this dude a nicer, newer set of foam armor rather than just take the easy way out and ship him our Mk. I suit. Aside from having mad respect for the guy for actually having the ambition to build a show off of one of our suits, we also want to submit our best work for something as big as that – not our worst from 5 years ago. It’s going to be a very new experience building a suit for someone who’s never going to be able to test-fit it (our client is in Alabama, while we’re in California). We’re confident that the measurements of his body alone should be good enough for us to work off of, and we’ll be using new buckle styles to compensate for variances (versus precision-sized elastic we’ve used in the past because we could test-fit the tightness on my partner right then and there). Getting into the grind at the beginning of winter instead of the dead of summer is the strangest feeling ever. The ingenious poor man’s glue pots strikes again. The renders for the upper body are all but finalized in SketchUp, meaning it should be a simple matter to follow that design to a T and built it all accordingly out of foam. My partner and I have had a sort of established building order since Barbatos – we’d start off with him building the torso, while I put the head together. This time though, we didn’t have the measurements for the head yet, so while he worked on the chest as always, I went for the arms. Our PepBoys garage foam has some particularly deep pockmarks this time for some reason. Fixable. My partner designed the cuffs on the forearms to be ever so slightly wider than one foam’s width, meaning I now have to go through the task of cutting out strips to fill it in and mate the whole unit. Didn’t take as long as I thought it would, thankfully. There are some gaps and unevenness from the strips that build out the cuffs, but thankfully they all fill in easily with Kwik Seal. I…think this is what my partner has of the torso? The disadvantage of building everything in large sheets of foam, especially for something as giant and complex as the main body, is that the foam’s natural roll will make things very floppy and hard to work with. Looking like a chest (kind of). Got the shoulders and biceps knocked out super quick, since building a gift box from WalMart is more complicated than this. We probably could’ve just left the forearms as shoeboxes the way it actually is on the RX-78-2, but it didn’t hurt to add some extra flair as long as it wasn’t incredibly complicated. Very basic elbow flairs, almost similar to the forearm guards on the Wing Gundam EW. Our render of the arms also had vents in these elbow pieces, because why not. It probably would’ve been easier and more efficient to just insert a flat piece and scribe lines to make the vents, but I decided to go for actual grille lines because I’m a builder, dammit. And finally finishing them up with some plate covers with wrist cutouts. Torso looking somewhat more solid now. It’s not really going to firm up until we get the main front plate on. You’d think this would be a very straightforward process – cut out the plate, line it up to the outlined foam, and stick it together. Unfortunately among our issues is the contact cement this time being somewhat less potent than what we’ve used before. It’s the same stuff as always, but for some reason it doesn’t hold foam together quite as well as it used to. The bigger issue is the front plate straight up not lining up in some areas. But this is fixable with some cutting and trimming around. Separate pieces are cut out and used as raised detail bits on the abdomen area. Our buddy who usually loans us his heat gun and Dremel for our projects couldn’t come through this time (probably because he only grows those tools during the summer, harvesting issues and whatnot) so we went out and got our own budget heat gun from good ‘ol Harbor Freight. Now that the arms are done and my partner is still grinding away at the chest, I figured I’d round out the upper body by getting the backpack together. Starting with some double layered cardboard for a rigid backplate. This suit won’t require a PVC pipe backpack frame the way our last three armors have, since there’s nothing crazy hanging off the rear. We hadn’t even designed the backpack in SketchUp (because who looks at the back, amirite), so I basically went into this completely freehand. I really didn’t want to just build an RX-78-2 backpack, since this was our chance to step out of the bounds of Gundam design and just make something that looked cool. As such, I took some inspiration from the original MegaZord’s backpack, where it had two cannon-like protrusions lined up next to each other. I wasn’t going to actually make cannons though; it ended up looking more like a traditional jetpack. I think the bridge pieces down the middle ended up looking really mad – it was just a spur-of-the-moment idea when I placed a piece of scrap foam in there and decided it looked good. Now it’s finally taking its actual shape. Everything about this suit so far just feels gigantic, probably because we’ve been building slender and form-fitting suits for the last two years, so a return to the big blocky super robot design is jarring. Chest ring made out of a simple strip of foam. And finally adding cardboard supports to the insides to make the thing stop flopping around. It doesn’t look the best when you view it from the interior, but it’s a worthwhile trade-off to make sure it stays rigid. That was one roll of foam just for the majority of the upper body. I don’t think we normally run out that quick because our suits never need this much surface area, so we had to crack open a new roll rather quickly. The 100 pack of fresh blades from Quanta’s build strike again. Bending things to make them fit when they don’t – because that’s how we work. I thought the backpack ended up looking too plain though, despite how proud I was otherwise of its somewhat original design. It needed an extra flair to make it look more super, so I took some inspiration from classic super robot designs like Mazinger Z, which had big ‘ol wings/back protrusions. I didn’t want to make it look too big and too crazy though, since I’m admittedly building this entire backpack unit without the approval of our client – since he never specified anything for this part we figured if we kept the design consistent with the rest of the suit almost anything would work. My logic then followed that it would be okay to build some wing-like protrusions, as long as they weren’t super large and ostentatious. The original intention was to make wing-like protrusions that weren’t actually wings. But then the best “protrusions” I could build were actual wings. D’oh! Now it looks like a legit detachable jetpack and that introduces new implications to a mech that we’re not deciding the story for, so there’s a chance this element won’t fly (haHA puns!) with our client. Building out the trim for the half-circle on the chest. This bulge that smooths into the upper chest plate was a harder design element that we threw in on the SketchUp model because it worked, but in reality with foam it’s quite a bit more difficult to pull off. I don’t even know what exactly my partner did to gouge the foam like that in an attempt to smooth the line, but it’s mostly working. Kwik Seal is also good for this molding smooth business. The measurements of the wearer that we were provided are already larger than the usual dimensions we work with for my partner, but we also went and sized everything slightly larger in order to accommodate for possible measurement deviations and fitment issues (better to build with adjustable straps and larger armor than build the armor itself too small for the client to eventually fit into). The result is that the torso looks absolutely huge, especially on my partner’s skinnier build. Somewhat ironically, it fits super flush on my body without any straps. This is the only time I’m actually able to test fit any cosplay we build, since they’re always too small for me to wear. As somewhat expected, the wings didn’t fly (HAHA) with our client after we showed him this picture, but at least I have the comfort of knowing that he did indeed love the look, but logistically the mech wouldn’t be flying in the production he was shooting, so there was no actual reason to have wings just for the sake of having them. So, in about one weekend we have most of the upper body, including the torso, backpack, and arms, all knocked out. Unlike our summer building sessions, school is in right now, so my partner and I are only able to work on the suit two days out of the week (Friday and Saturday – Sundays are of course the Lord’s day, where we pray for forgiveness to our great savior as we cram for the week’s upcoming tests). With a build schedule like this, we’re hoping to get it all ironed out by the end of November or early December at the latest, since we still have a deadline for our client to meet.